Having been in business since 1979, we’ve had substantial experience helping homeowners in the Twin Cities remodel their kitchens and bathrooms. Of these projects, some of the most rewarding have been completed in historic homes. A highlight for our construction department was having a kitchen remodel our team completed on a 1930’s home, that was featured on the Minneapolis & Saint Paul Home Tour. Here’s how the kitchen looked when Liz first invited us into her home. When Liz invited us to her Fulton neighborhood in Southwest Minneapolis, we were eager to learn more about the renovations she had in mind. Like many other homes built in the 1920’s, a common complaint is space constraints. Her U-shaped kitchen also lacked a dishwasher, something she desperately wanted to add. Other outdated aspects of the kitchen included the appliances, countertops, cabinets, windows, and flooring. The kitchen windows went down below the countertops which made them hard to operate. In the bathroom, the tile was in great shape and a feature worth holding onto. In addition, however, several other features such as the bathtub, toilet, medicine cabinet, and window that warranted replacement. 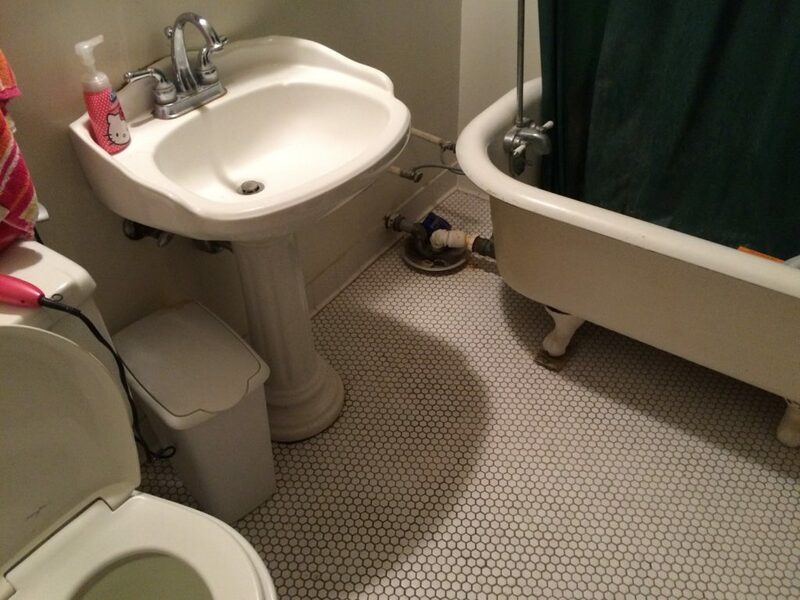 The bathroom flooring was in great shape and something we recommended keeping. Here are the custom home renovations we suggested to transform both rooms into exactly what Liz wanted. Kitchen: One reason Liz’s kitchen felt cramped was that the previous design neglected to take advantage of the room’s vertical space. To address this concern, we added custom, soft-close white painted maple cabinets that stretched to the room’s nine foot ceiling. 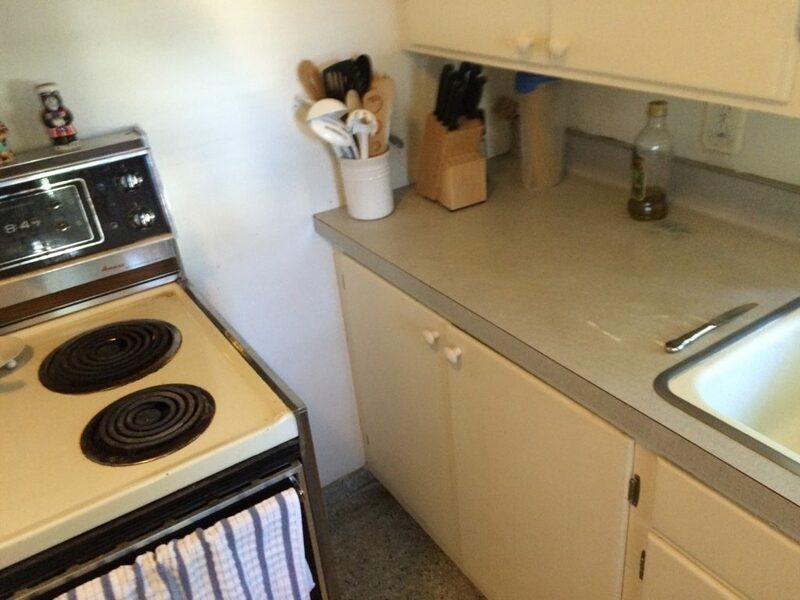 The previous countertops were bland and run-down. 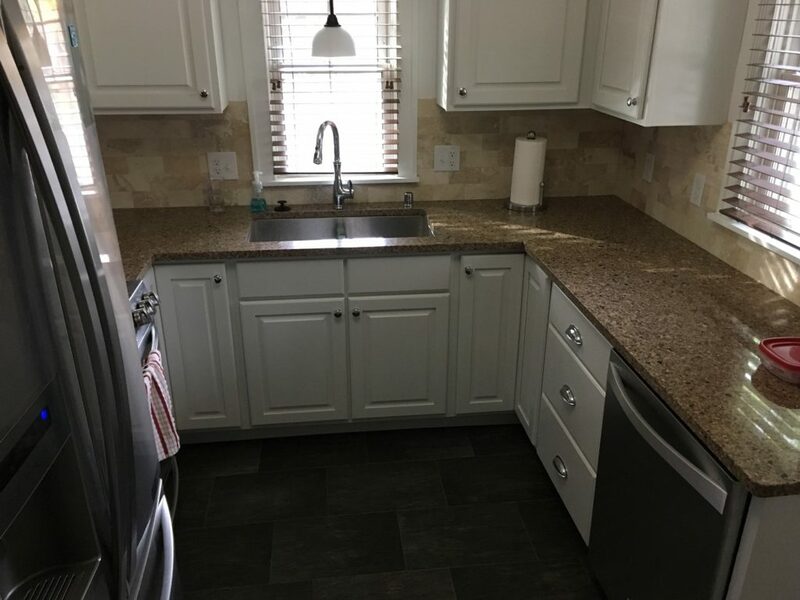 In their place, we installed Silestone countertops in Sienna Ridge, which is an alluring combination of browns, grays, and blacks. Quartz countertops are becoming an increasingly popular selection due to their stain resistance and ease of cleaning. A beige Travertine backsplash was also installed. This product wins favor with homeowners for being low-maintenance and long-lasting. The appliances and sink were upgraded to stainless steel. To modernize the flooring, we installed luxury vinyl tile, designed to imitate the look of slate. New SeasonGuard windows were also installed in the kitchen to promote energy-efficiency and natural light. For easier use, we corrected the initial design problem and raised them above the backsplash. While the kitchen itself did not grow in size, the new configuration allows for more storage space. Bathroom: The flooring within the bathroom was in a great shape, historically accurate, and a beautiful neutral tone. Rather than tear it out, Liz opted to keep it and choose finishes and fixtures that worked well with the versatile flooring. Before the remodeling began, the bathroom sink was a pedestal design, which worked well because of the minimal space it took up. We recommended keeping this configuration and updating the sink to something more modern. Major updates to the bathroom included a new tub, sink, shower surround, and SeasonGuard window. A contemporary medicine cabinet with sconce lighting in a bronze finish was also installed. 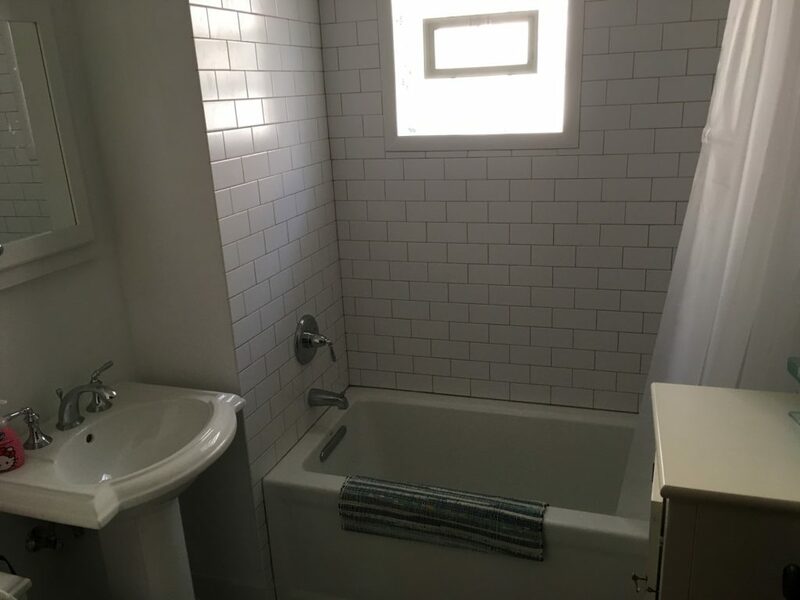 The claw foot tub within the bathroom was great for soaking, but less desirable for showering because of the 360-degree curtain that was susceptible to leaks. Wanting a solution that incorporated universal design and a more modern feel, we suggested a Kohler alcove bathtub with a tile shower surround. As is the case with many historic bathrooms, Liz’s had a window in close proximity to the shower. In order to prevent leaking and provide complete privacy, a new 24 x 24 SeasonGuard window with frosted glass was installed. SeasonGuard windows are comprised of vinyl, making them a perfect choice in a bathroom, as there is no worry of moisture causing rot. "I hired Lindus Construction to install leafless gutters. They were able to promptly schedule me during a busy fall season, and did an excellent job with the installation. Things seem to be working great thus far. Would definitely recommend!" - April W.
"Lindus did a very nice job with my LeafGuard® Gutters. Workmanship was great, and the crew was very courteous and easy to work with when I had a couple special requests while they were on-site. Would definitely use them again." - Frank G.